SANTA CLARA, California, March 7. IN Part I, I introduced a case study of a swimmer with “tight hamstrings.” Before we get back to this athlete, we must discuss how static stretching influences performance. Many athletes stretch. This high incidence likely contributes to the perception that static stretching improves performance. Though athletic performance and static stretching receive research, a lot is still not understood. Many studies look at power or force and try to extrapolate this to performance. These factors are important, but not nearly as important as performance. Studies looking at static stretching report strength endurance impairments after as little as 30 seconds of static stretching (Winchester 2009). This impairment in strength has even occurred in various athletes of various training experience (Serra 2012). These results imply after a short bout of static stretching, all levels of trained individuals have a decrease in strength. Studies also suggest static stretching decreases acute power (Behm 2011; Power 2004). The majority suggests an impairment or non-significant change. Remember, using the entire body of evidence is crucial, not just one study. Guissard (2004) found a bout of static stretching decreases tonic reflex activity, an indicator of neural drive and a potential mechanism for impaired power. Another possible mechanism is static stretching decreases musculotendinous (Evetovich 2003). Decreasing stiffness impairs the ability to use elastic energy during the stretch-shortening cycle. Plus, it seems static stretching even impairs upper extremity (Gergley 2012). However, some studies suggest static stretching to the upper body may be different and have a neutral effect on throwing power. Some feel stretching may alter biomechanics for the better. Unfortunately, altered biomechanics doesn’t necessarily improve biomechanics. Biomechanics are suggested to change within PNF and static stretching, but this study didn’t look at running skill or performance (Caplan 2009). Other studies have found running biomechanics are not altered after static stretching (Hayes 2007). Clearly, more research is needed. A large systematic review found long duration static stretching (greater than 60 seconds) impairs performance (Kay 2012). This study also concluded stretching between 0-45 seconds did not significantly alter performance (Kay 2012). Decreases in performance and increases in range of motion can last up to one to two hours following static stretching. The volume and intensity of static stretching was found to have a direct impact to impairment as greater duration of stretching resulted in greater deficits. This includes total time of accumulated stretches, when the total duration of static stretch on a single muscle group reaches or exceeds 90 seconds; there is strong evidence for performance impairments (Robbins 2008). Variable results exist for static stretching less than 90 seconds. Evidence points to the use of shorter duration of static stretching (less than 30 seconds) to minimize the negative force production changes. The degree of discomfort felt while stretching also appears to play a role in detrimental effects of static stretching. The collected results show stretching held at discomfort had negative effects on performance, while static stretches held to a point “just before” discomfort had a mix of no effect on muscle performance (Behm 2011). Longer static stretching held at discomfort does impair performance, in general. Static stretching also alters biomechanics, a consideration for those prescribing stretching. For acute performance, short static stretching likely doesn’t alter performance when held “just before” discomfort. Once again, general stretching is a waste of time at best. Interested in learning more on static and dynamic stretching? How about self myofascial releases and other forms of mobility? Check out the Mobility for Swimmers System . 1. Winchester JB, Nelson AG, Kokkonen J. A single 30-s stretch is sufficient to inhibit maximal voluntary strength. Res Q Exerc Sport. 2009 Jun;80(2):257-61. 2. Serra AJ, Silva Junior JA, Marcolongo AA, Manchini MT, Oliveira JV, Santos LF, Rica RL, Bocalini DS. Experience in resistance training does not prevent reduction in muscle strength evoked by passive static stretching. J Strength Cond Res. 2012 Nov 30. [Epub ahead of print]. 3. Power K, Behm D, Cahill F, Carroll M, Young W. An acute bout of static stretching: effects on force and jumping performance. Med Sci Sports Exerc. 2004 Aug;36(8):1389-96. 4. Guissard N, Duchateau J. Effect of static stretch training on neural and mechanical properties of the human plantar-flexor muscles. Muscle Nerve. 2004 Feb;29(2):248-55. 5. Evetovich TK, Nauman NJ, Conley DS, Todd JB. Effect of static stretching of the biceps brachii on torque, electromyography, and mechanomyography during concentric isokinetic muscle actions. J Strength Cond Res. 2003 Aug;17(3):484-8. 7. Marek SM, Cramer JT, Fincher AL, Massey LL, Dangelmaier SM, Purkayastha S, Fitz KA, Culbertson JY. Acute Effects of Static and Proprioceptive Neuromuscular Facilitation Stretching on Muscle Strength and Power Output. J Athl Train. 2005 Jun;40(2):94-103. 8. Caplan N, Rogers R, Parr MK, Hayes PR. The effect of proprioceptive neuromuscular facilitation and static stretch training on running mechanics. J Strength Cond Res. 2009 Jul;23(4):1175-80. doi: 10.1519/JSC.0b013e318199d6f6. 9. Hayes PR, Walker A. Pre-Exercise Stretching Does Not Impact Upon Running Economy. J. Strength and Cond Res. 2007; 21(4):1227-1232. 10. Kay AD, Blazevich AJ. Effect of acute static stretch on maximal muscle performance: a systematic review. Med Sci Sports Exerc. 2012 Jan;44(1):154-64. doi: 10.1249/MSS.0b013e318225cb27. Review. 11. Young WB, Behm DG. Effects of running, static stretching and practice jumps on explosive force production and jumping performance. J Sports Med Phys Fitness. 2003 Mar;43(1):21-7. 12. Robbins JW, Scheuermann BW. 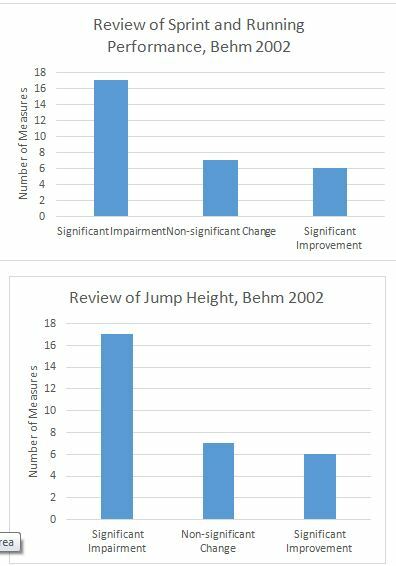 Varying amounts of acute static stretching and its effect on vertical jump performance. J Strength Cond Res. May 2008;22(3):781–786. 13. Amiri-Khorasani M, Mohammadkazemi R, Sarafrazi S, Riyahi-Malayeri S, Sotoodeh V. Kinematics analyses related to stretch-shortening cycle during soccer instep kicking after different acute stretching. J Strength Cond Res. 2012 Nov;26(11):3010-7. doi: 10.1519/JSC.0b013e3182443442. 14. Behm DG, Bambury A, Cahill F, Power K. Effect of acute static stretching on force, balance, reaction time, and movement time. Med Sci Sports Exerc. 2004 Aug;36(8):1397-402. Dr. G. John Mullen received his Doctorate in Physical Therapy from the University of Southern California and a Bachelor of Science of Health from Purdue University. He is the owner of COR PT, strength and conditioning consultant, creator of the Swimmer’s Shoulder System, and chief editor of the Swimming Science Research Review.